It was Sunday afternoon and I was itching to get back out and shoot some photos. I knew that there wouldn’t be a remarkable sunset as the sky was perfectly clear. 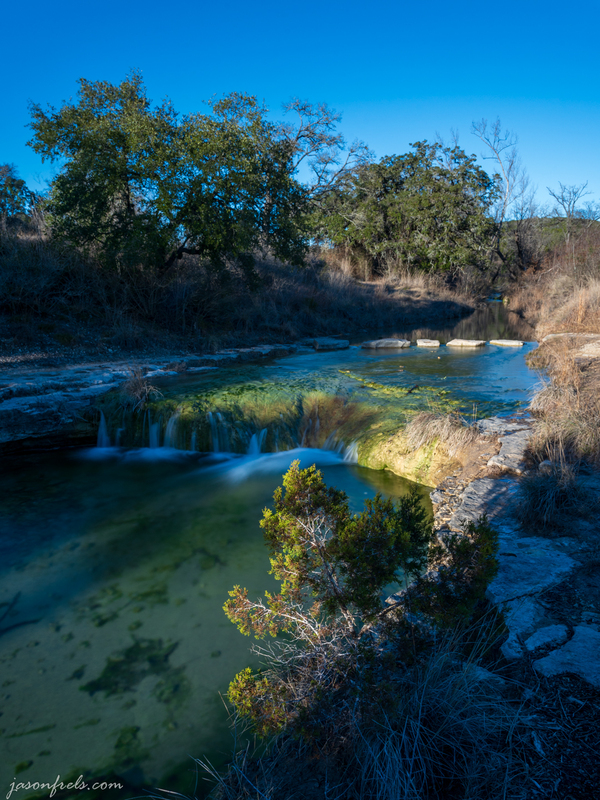 I did think that I might be able to do something interesting with the little stream and waterfall at Balcones Canyonland National Wildlife Refuge, so I headed over there. I got to the stream crossing just as the last of the afternoon sun was reaching the water. There are some large trees to the west which begin to block all the light this time of day. After a bit of experimenting, I took the following 10 second exposure. I worked around this little shrub in the foreground which was catching a bunch of light and framed it in the curve of the waterfall behind it. I also wanted the stone path visible in the background. The scene was partially in shadows and I probably should have arrived earlier in the afternoon to get this shot. I did wander down the stream a little bit looking for another vantage point. 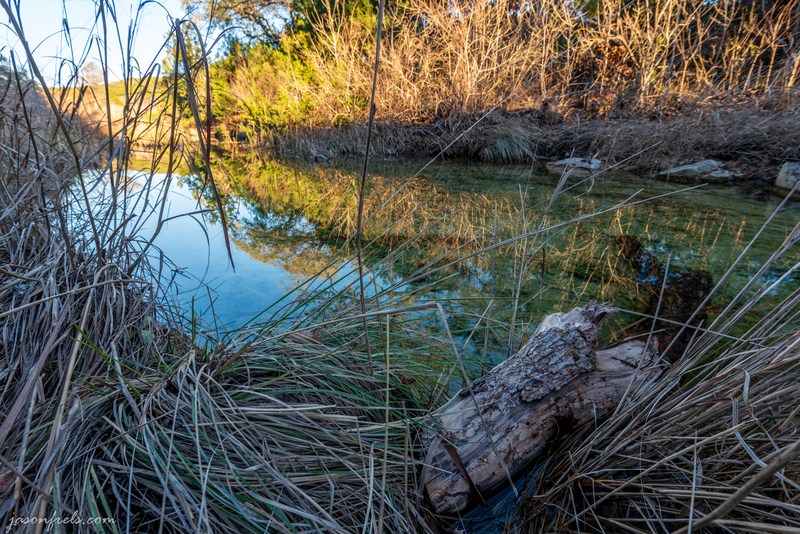 After fighting some thorny brush, I did settle on a log in the stream that was mostly facing the wrong way. This is with the tripod very low to the ground in the weeds. This shot was a hassle and didn’t really work because the background is a mess without a focal point. This was also a very contrasted scene and I had to yank the sliders to near the extremes in LightRoom to get much of an image. I didn’t think to attempt an HDR series. For my last shot, things went more my way. Every time I go to this place, I see the afternoon sun glinting in the tall grass and I have tried to find a way to capture this. This effect generally only happens when the sun is at a slight angle from your eyes and in the frame, so any picture is going to be fighting bright sun and lens flare. So, I hid behind some trees and got down low to try to capture this. I think I got a pretty good capture, if not a perfect representation of what I see. 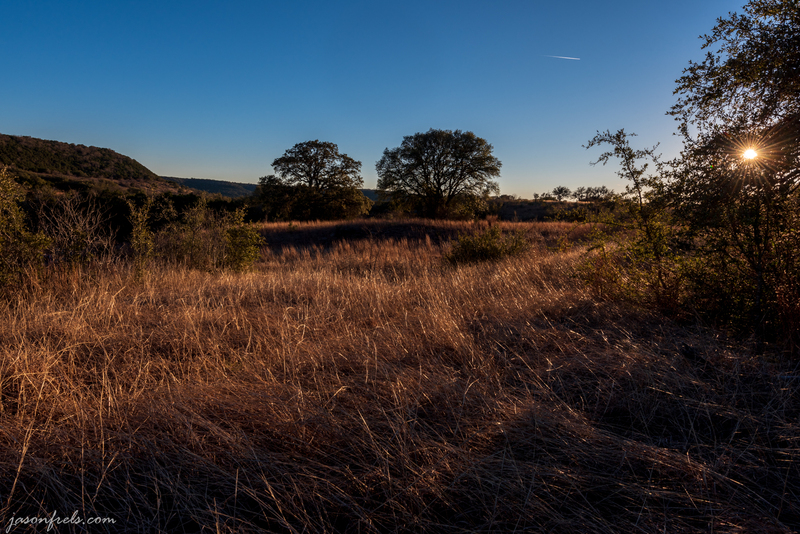 I dialed the aperture way down to try to get some sparkle in the grass and some star flare in the sun. You do see the sun high-lighted grasses with sweeping lines that point off to the trees in the distance. The grass is so golden, I am not sure that it translates well to a photograph, depending on the monitor. I don’t ordinarily get good sun stars in my images, but this one worked well. Ordinarily, I would find the blue sky boring, but I think that the color works well with the warm grass. Just one lone jet in the sky, which I don’t mind. The small aperture shots of a blue sky really remind me that I need to clean my sensor. I did a lot of spot removal in LightRoom. Hope you enjoyed a few photos. Thanks for reading.